Sweet Blog Friends it is ‘that’ time of year again!! 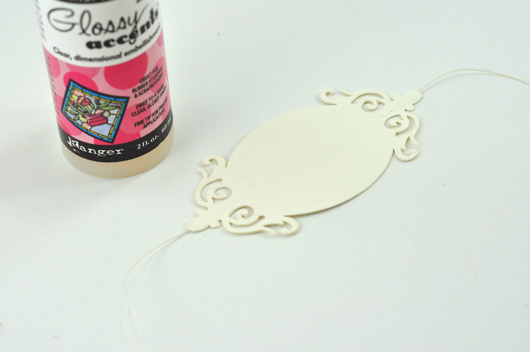 Seriously, you cannot imagine how excited I am to have a new Spellbinders die template to share with you today!! What makes it even better is that it’s the first die template I’ve designed for Spellbinders; I’m a new Spellbinders licensed designer, squeal!!!! I thought of something you might want to see in a template, because so many of you send me your dreaming emails. 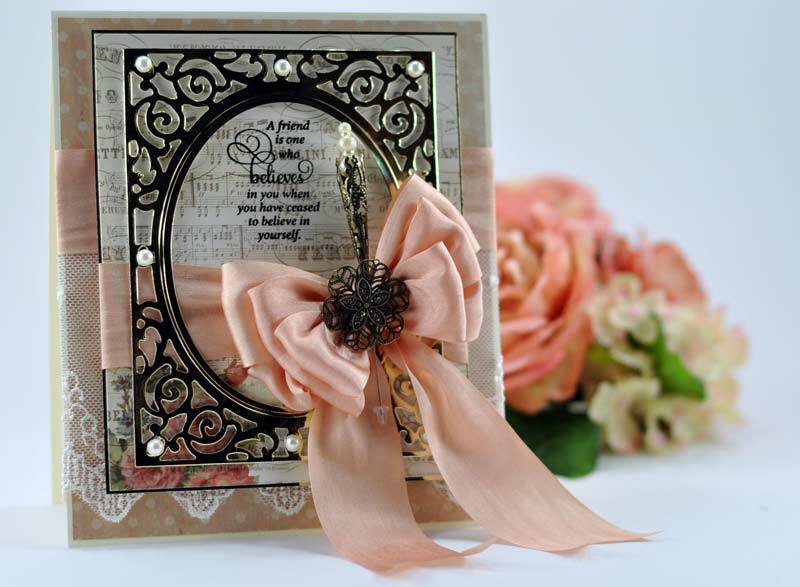 I’m sharing Spellbinders™ new A2 Filigree Delight S5-177. 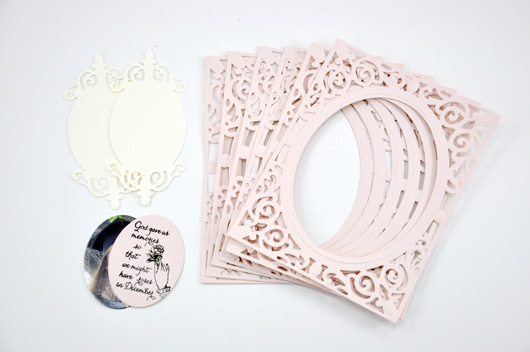 It conveniently layers with the A2 Sized Card Maker System of dies and is beautiful enough to stand alone in elegant invitations, dressy cards and three dimensional projects. Today, the first of two projects I’ve created is a keepsake, a Filigree Dimensional Frame that holds a wallet sized picture. 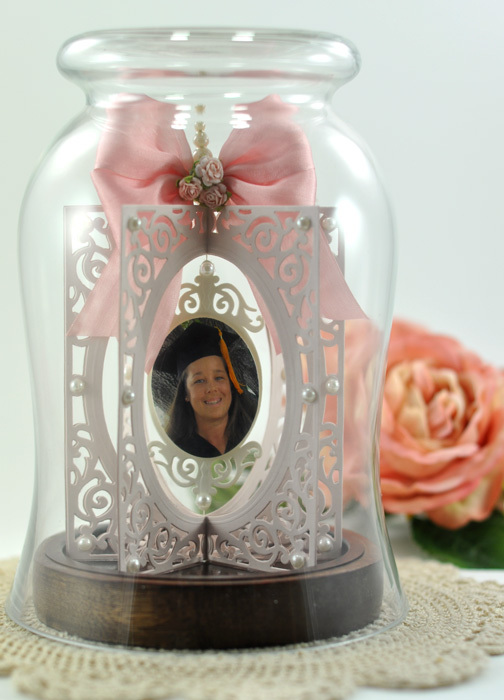 It can be sent flat and when opened up, can be dressed up for permanent display under a glass candle globe. I’ve made several (gush!) 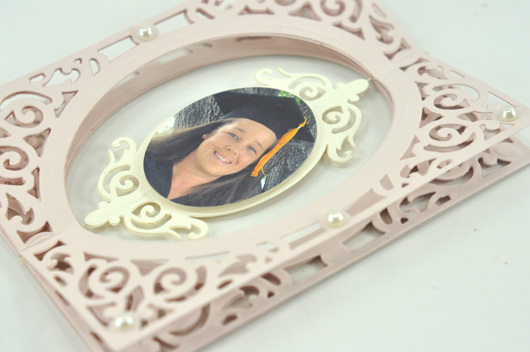 and a duplicate of this one of my sweet girls college graduation, graces the table in the entryway in my home. I can’t wait to make another for a new baby my friend just had! It’s just a step up from a card and something I know she’ll keep. 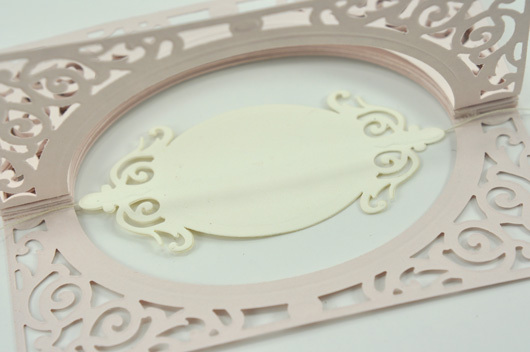 Using A2 Filigree Delight S5-177 and larger inner oval – tape templates together so that each of your cuts will be identical. Cut/emboss six panels from pink card stock, using wax paper for a quick release. 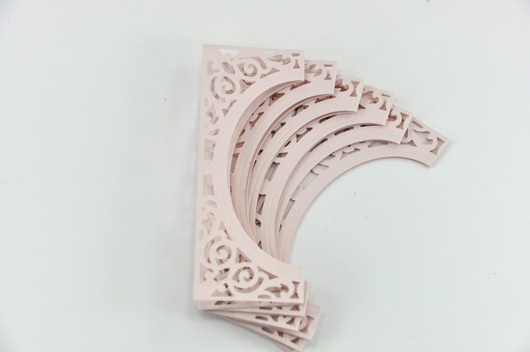 Score each of the filigree panels along the center vertically, folding so that wrong side is outward. Wrong sides together – use Glossy Accents sparingly on outer edge as well as rim of the oval opening to adhere each folded, scored panel on top of each. Continue to adhere, until all six panels are in one stack. Using Glossy Accents adhere both smaller inner oval motifs wrong sides together while sandwiching 10” length of strong thread along the vertical center. 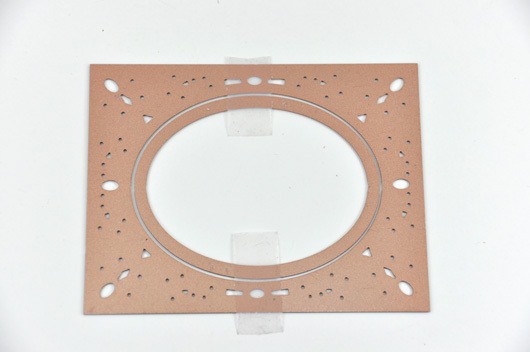 Adhere first open edge to last open edge using Glossy Accents sparingly along outer edge as well as rim of the oval opening at the same time lay thread and attached smaller inner oval motifs along the center channel before matching the first and last open edge. Once Glossy Accents has dried, trim thread on bottom. 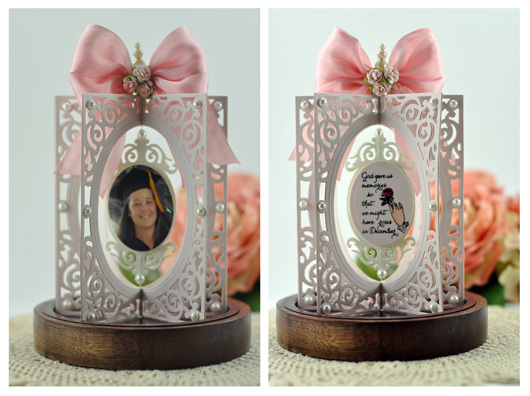 Using Foam Tape mount picture on one side of one oval motif and sentiment on the other side of one oval motif. Then apply three flat pearl stickers to each flap of the dimensional frame. 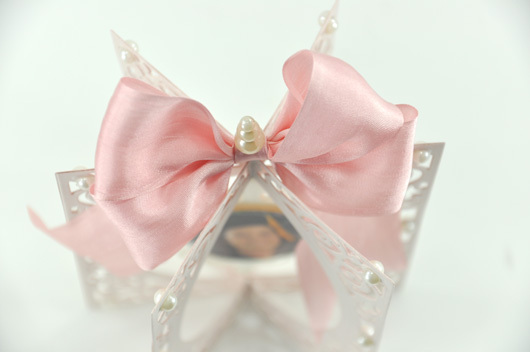 Tie a stand alone bow from Silk May Arts Ribbon and spear center with Maya Roads Triple Pearl Pin. 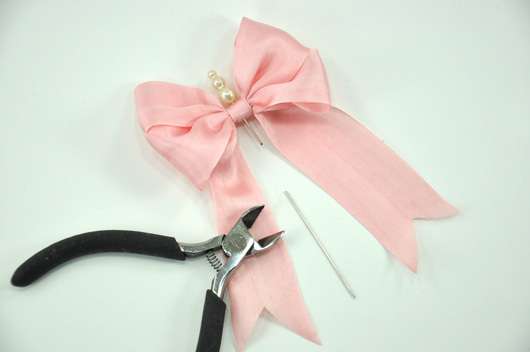 Using Wire Cutters and wearing Protective Glasses, cut pin to 1.5” length or substitute regular straight pin. Apply Glossy Accents sparingly to the opening hole where all the legs of the Dimensional Frame come together then insert cut pin. Trim thread. Display in Glass Candle Holder and take a second to marvel and what you’ve created! Now have another peek at what this die template looks like when incorporated into a card!! If your taste is a simple project like a card to send to someone special, this one is easy – the die template does all the work for you! 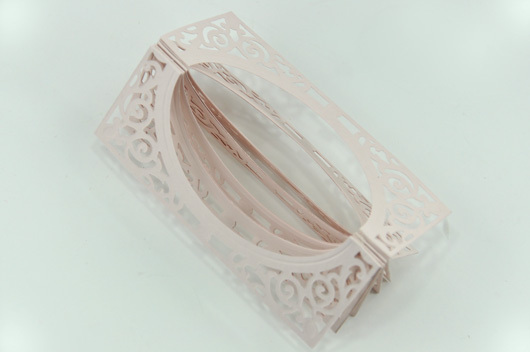 The open filigree allows you to showcase anything behind it. 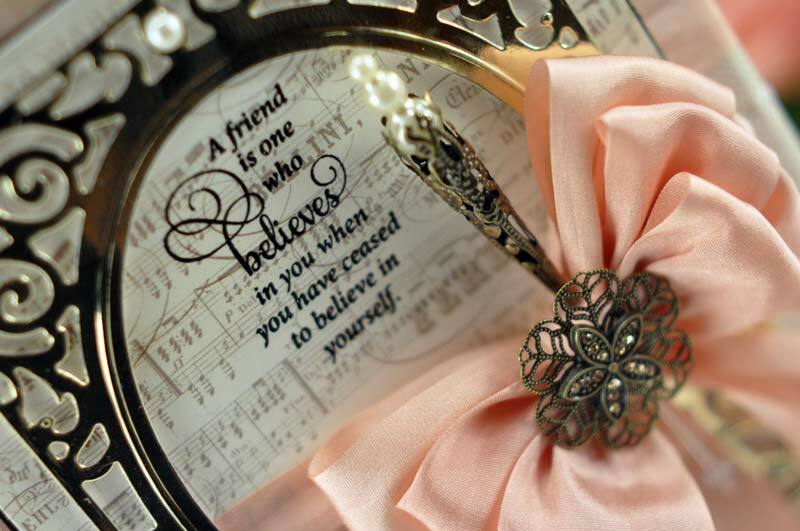 It’s your choice whether to keep the panel solid or use the included oval to make it framed to showcase your sentiment. I’ve cut mine out of gold foil paper, but white would make a very delicate, lacy overlay. Because the die layers with the other A2 Cardmaker Sets, you simply cut out additional layers, stack and then you’re done. So I hope you see something that will tickle your crafting fancy! 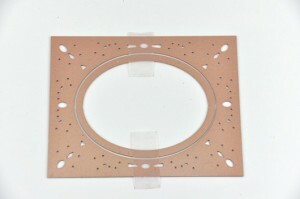 You know we couldn’t show new die templates without some kind of prizes so keep reading to get all the details. Click (winners have been chosen, link no longer valid) to Enter and WIN! WOWWWWW…. is all I can say……..
Oh my goodness Becca, it always shows how amazing it´s going to be, when you´re opening the ball, and I can see, that this year it´s going to be absolutely amazing. Your wonderful creation here just almost makes me fly here. Soooooooo gorgeous work Becca. I´m overwhelmed with the beauty and elegance in your project, soooo soo beautiful. Yes, congratulations to you, you certainly deserve it. Congratulations on designing for Spellbinders. These are gorgeous designs Becca, you always create things with such beauty and elegance. This is absolutely stunning! LOVE it! Not only have you designed a wonderful die, you’ve designed beautiful creations using the die! Love, love, love the die and what you have showcased with it! Many congratulations on your new appointment :) Well deserved and can’t wait to see what else you come up with! Amazing work, such beauty and elogence! So looking forward to seeing more of your gorgeous work! Love your NEW DIES they are BEAUTIFUL! Love the 3d projects and think i will be doing a lot more of them this year. This comes as no surprise to me that you are now a Designer for Spellbinders. We are the lucky ones to be able to buy these ideas that have come to frutation. My congrats!! The die is absolutely wonderful. And the picture frames devine! Keep that mind working as we know there is so much packed in there that 2013 is going to be a treat for all Spellbinder fans!! This is absolutely beautiful! An incredible work of art. Each time I think, “oh that is the most beautiful”, then you make something even more incredible. Congratulations!!! The design is absolutely beautiful. I really like the way you used the die to display the photo. Really enjoy using Spellbinders and can’t wait to get my hands on the one(s) you design. Congratulations! 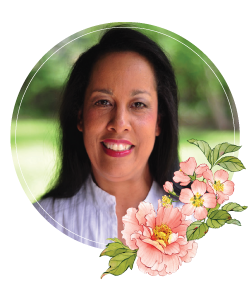 Spellbinders is fortunate to have you on their team. You creative beautiful things from your fantastic imagination! Wow! As always thank you for sharing, and wishing you a new year filled with blessings. Congratulations Becca on your new Spellbinders journey, I know it will be filled with many great challenges and rewards for you. You’re such an amazing designer and your cards and keepsakes are all just stunning. Congratulations on your new spellbinder position, i am both happy and excited for you!!!! Beautiful project! Thanks for sharing! Another amazing project from you Becca. Stunning work, you are such an inspiration. Happy New Year and all the best for a crafty 2013. Because, you,ve done it again! What a beautiful die! What a wonderful way to start off the New Year!!! Congrats Becca as a new Spellbinders Designer!!! It looks as tho I’m going to have to start saving $$$ so I can buy more dies from Spellbinders!!! I can’t wait, I love them! Your 3-D project and card are just gorgeous! I’m always in aw over what you have created, what a talented lady you are!! Simply stunning!!!! Thank you for sharing this ideas Becca you did an outstanding job! Happy New Year Ms Becca and to your Family as well :-) What a wonderful way of starting the new year with your first Die Template for SB YAY! Congrats! I absolutely love your work and was happy to hear of your Kit Club that I join as it was launched :-) This lovely piece you have created showcasing your daughter’s milestone is amazing! I look forward to tons of inspirations from you for the New Year :-) God Bless! Wow!!! All I can say is that this is so beautiful!!! I can see something like this as an ornament too (well, perhaps a little smaller). This is so special and beautiful! Congratulations on being a Spellbinders designer. You have created such beautiful projects with this pretty die. I especially like the photo holder – thank you for the wonderful tutorial. O H, M Y! I love love love your creation! I’m really speechless. Congrats Becca on becoming a licensed Spellbinder designer. I knew it was only a matter of time. And, what a gorgeous die set you have come up with. Just love it and the wonderful projects as well. You have definitely come a long way Becca, and we are all so very proud of you. Since I have been following you now for several years I can say ” I knew you when” and never doubted that your talents would lead you this far and I am sure we will be seeing so much more to come. Thank you and God Bless. of anyone you deserve it .. I have always told my friend that YOU were the QUEEN of dies…. and now it is official.. YOU are on the team. Congrats Becca….your design is a MUST HAVE – PERFECT in every way! Thank you for blessing us with God’s gift of design to you!!!! Your frame and card look amazing, as always! Happy New Year, sweet roomie! May 2013 be filled with Happiness, Health and success. Congratulations on a perfectly lovely design. Your cards are beautiful and your use of Spellbinders an inspiration. Glad to hear you are designing for Spellbinders as you are an excellent ambassador for the dies. I follow your blog everyday from my little village in Scotland and look forward to seeing your next work of art. You still amaze me with your creations and now with your talent as a die template designer for my favorite die company. You are one amazing lady. Love both of your projects. So many beautiful details. Becca-I can imagine how proud you are to have designed something that 1000’s of people will use & enjoy! Congrats! Congratulations on another accomplishment. You first introduced me to Spellbinders via your blog. My collection has expanded quite a bit. It just seems right that you should be designing for them (you are a walking advertisement for them)! Your template is beautiful and I can’t wait to purchase it. Is it now available to the rest of us? I just can’t believe how one person can have so much talent but each day you come up with another surprise. Am so happy for you and am so sure your new project will take off like the wind. You are so talented and you deserve all the praise and love you get from you new creations. Love each and every one of them and am so in awe of you every time you come up with something new. Thank you Becca for all you do for us and for all the encourgement you give to us. Becca I constantly marvel over the positively stunning things you create. Even when I don’t have time to create anything myself, stopping by your blog brings joy into my day! WOW! I just found your blog & am thrilled with the die you designed. It is exactly what I have been wishing for. Wow that is beautiful. you sure are talented. YOUR CARDS OUT OF 199 OTHER CARDS. THEY ARE FANTASTIC. I can’t believe there are such creative people as you are…I can make cards but that is about it…never would have thought of making something so beautiful with this forgeous dies!! One word STUNNING ! Thank you for your step by step instruction you are a very talented lady working with a great set of dies. Hi Becca your creations are fantastic, thanks for a chance to win this awesome die, can you please delete my first entry as I wasn’t wearing glasses when I was at work and typed my email address in wrong. So beautiful, Becca! Wonderful showcasing of the new Spellbinders dies! Congrats and your new posotion! Was ever so alarmed though, as I don’t think that I received this in my inbox, but it seems that Spellbinders has still allowed me to enter! Hurray! Becca, I am so proud of you and Spellbinders!! They recognized your amazing talent and made you a designer!!! Your project is stunning and this die is one I’m getting for sure. Can’t wait to see what CHA has to show us with all the new projects. Been saving up for new releases. Both of your creations are works of art! WOW FACTOR is out of this world. So glad got to see them. Congratulations on being a designer for Spellbinders. Beeca your work is always above and beyond gorgeous! This also is another beauty and those new dies are great! Becca you always AWE me!! Geniously gorgeous!! Congratulations, Becca! Spellbinders is very fortunate to have you as their new licensed designer!! !